Organizing is simply one of the most irritating activities one has to do, but also one of the most important if you want to save time when your are in a crunch. Here are a few important items you need o keep your wardrobe in place. When it comes to organizing things, most of us are desirable to find an option to do the same, but are not really one of those ‘organizing types’, or that is what we at least think, it is a well recognized fact that staying organized always helps, and although it seems to be a tedious process, going for an organized approach in many aspects of life often saves a lot of time and is very convenient. And thanks to the numerous options we have in order to assist us in our endeavors in staying organized, it is not a very big ask any more. Following are methods to help you stay organized in various areas of day-to-day life, with a little help from fittings and fixture. • Hanging rails are a very common sight mostly in almirahs and bathrooms, and tend to serve various purposes, albeit very small ones. They can serve to be a place to hang fresh towels/clothes, or their used counterparts as well, and in the insides of almirahs for the same purpose. Although we often tend to forget to install hanging rails in the required places, it always leads to better convenience and space saving. • A hanging shoe organizer might not be the most common fitting at a house, but the main advantage it brings is the savings on space. Many times, we face the problem of unorganized shoe racks with shoes stacked on top of each other, which leads to the ones at the bottom getting stained badly and in some cases, also smell badly. With a hanging shoe organizer, this problem is automatically solved, as shoes are not placed at appropriate spacing, and not on top each other. • Sweaters are the most unorganized for many of us almost all the time, and it always seems to be a real task to put them in place. Even if you do make it a point to organize your cabinet once a week/fortnight/month, it always seems to get as bad as it was before you know it, mainly due to the new additions you have to do frequently, and the indecisiveness regarding which combination to wear on which day. However, with a hanging sweater organizer, one can be sure of keeping them in proper order, since it gives you an ad-hoc storage place in case you are in a hurry and can’t properly stack sweaters properly. • Kids always seem to put away all their things at all the wrong places, or misplace them more often than you can think. For the prevention of such kind of events to happen, an over door hanging organizer for kids is always the best option. It has plenty of pockets and lets kids store toys, toothbrushes and other small essentials that always seem to be misplaced when they are most needed. 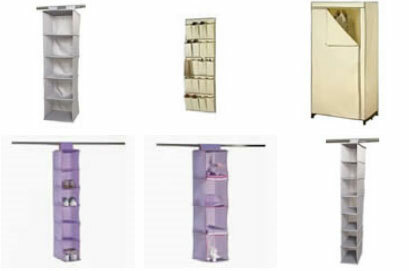 Caraselledirect.com is a UK based website offering a wide range of wardrobe organizers from leading brands in the country at the most competitive prices. There are also different options available at the site to suit your needs for every item.